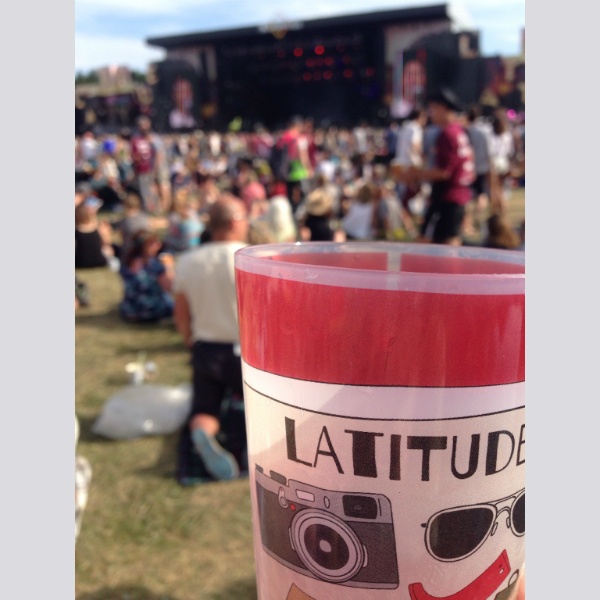 Freshly back from a long weekend a Latitude Festival near Southwold Suffolk and unlike most festival goers I’m feeling healthy and am not nursing a hangover! 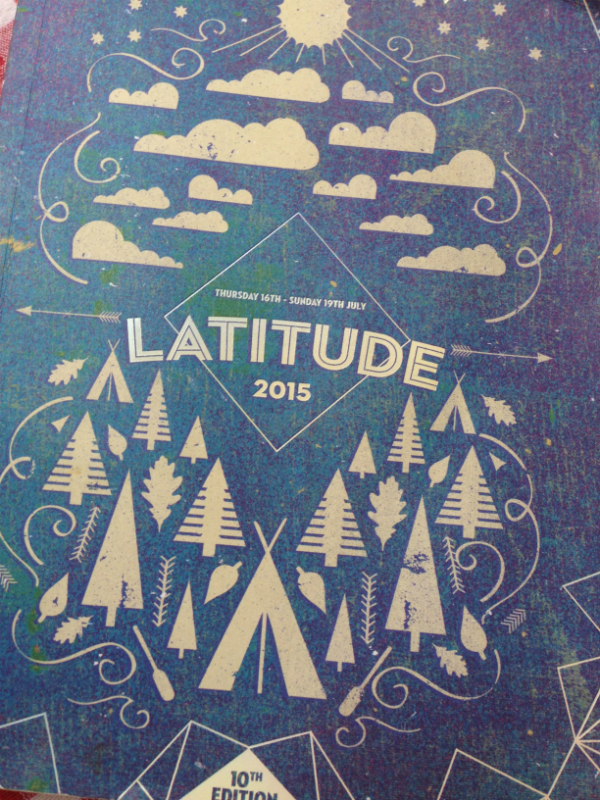 Latitude is the most laid back family friendly music and arts festival. 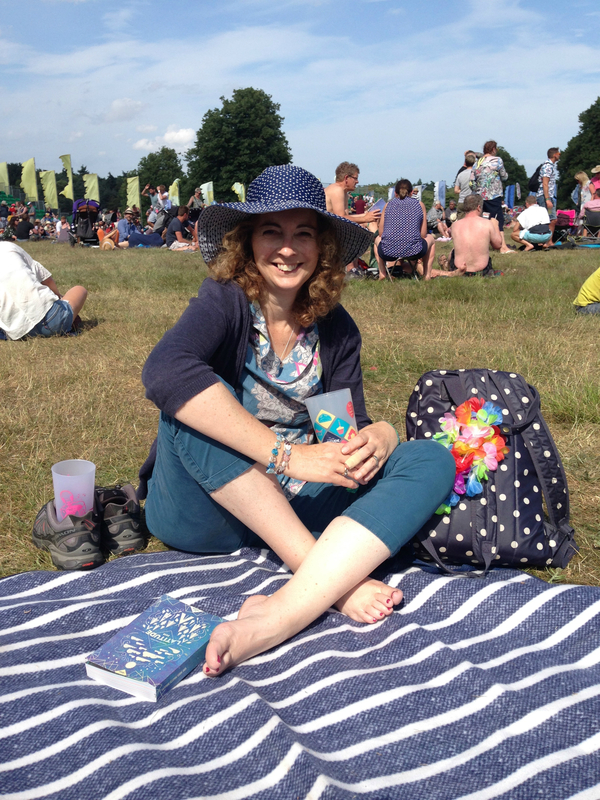 A weekend spent chilling in the woods to bands and an array of different musicians, sunbathing at the Obelisk arena or dancing to the latest bands at the 6 music big top, listening to poetry and crying with laughter in the comedy tent plus much much more. With numerous food intolerances, festivals aren’t the easiest of venues for me. But I think its worth the effort to plan ahead and go and have a relaxing and worry free time. We normally stay at the venue either hiring a family size camper or squeezing into a VW camper van but this year due to a last minute hitch we stayed quite close by in Ipswich with friends who kindly came to our aid. Having Coeliac disease and Crohns disease with numerous food intolerances including onion and garlic means I have to organise my weekend with military precision. The week before the event I start baking a freezing. This year grain free fruit and cherry bread, gluten free cheese scones, and a grain free bacon and vegetable quiche with extra cheese. I also get an order delivered from Ocado with things I can’t buy locally. 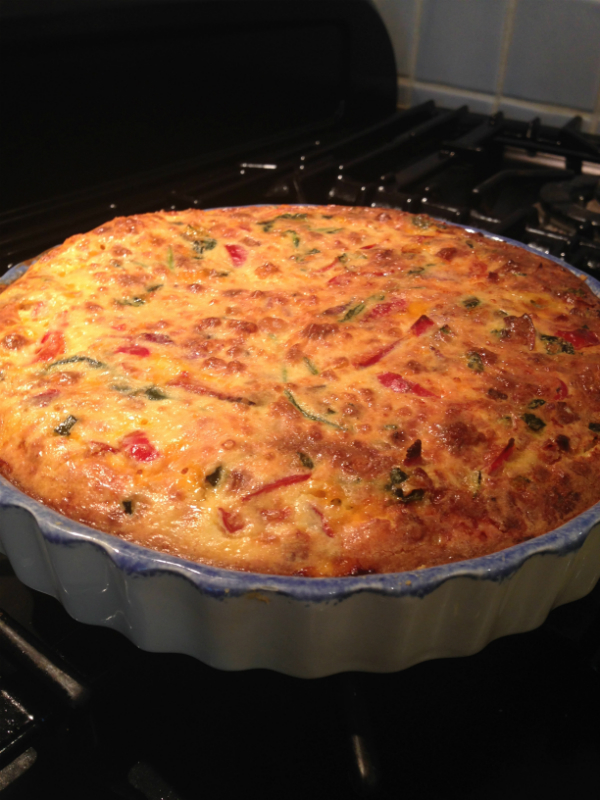 This year I took two large cool bags full of ice packs one containing eggs, salad, tomatoes, spinach, fruit and the freshly made quiche. The other containing the frozen fruity bread and frozen cheese scones, unsweetend almond milk, bacon, butter and gluten free cold meats, this year it was corned beef and ham from Waitrose. Each day I would take a small cool bag with mini ice packs that fits inside my ruck sack and a container for almond milk. 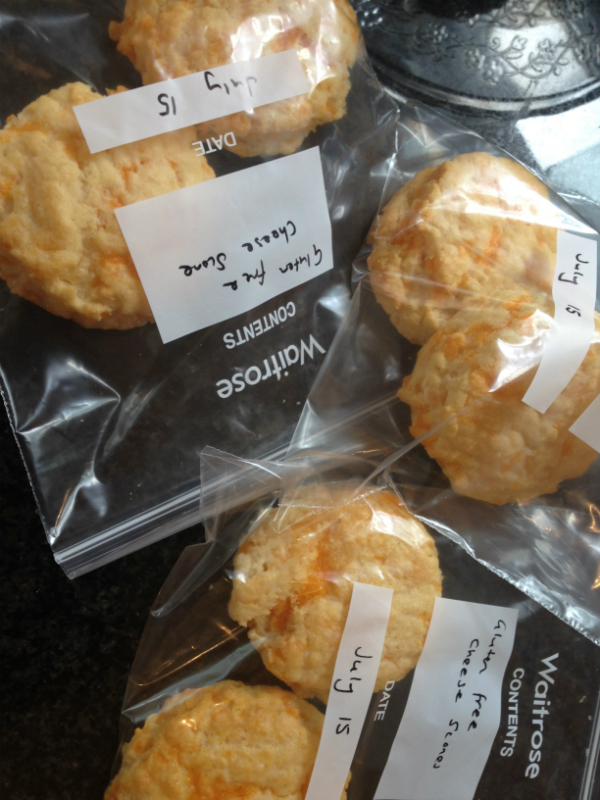 If you are staying on site with a fridge with freezer compartment you can refreeze these every night. This year I was able to use our friends freezer and fridge. They kindly cleared a shelf for my food. I can honestly say during our 3 days at the festival I was never hungry. I was however often envious and a little sad to not be able to partake in some of the delicious festival food on site, Im only human! Due to my IBD and wanting to avoid sugar, I am careful not to over do it with alcohol so over the entire weekend I had a couple of gin and tonics. If I could have found the Pimms i’m sure I would have given in to a glass. Some good news if you are gluten intolerant, or prefer not to eat gluten is that there are plenty of stalls advertising gluten free. From amazing beef brisket and rice to paella with chicken and seafood and chicken provencale. These choices seemed free from any gluten on the stall so probably fine for Coeliacs. I even spotted gluten free pizza ( baked onsite with gluten containing pizza ) , chips with toppings and indian cuisine. Unfortunately all these had contamination risk and with all the above contained food stuffs that I am intolerant too. One example of having to stay vigilant is that one afternoon I went an ordered a tea from a waffle stand ( very few stalls were solely tea and coffee stands. The guy serving me was covered in flour, up his hand and arms and all over his apron. I watched as he put his gluten floury hand inside my cup and picked up a tea bag. This was one of those occasions when you just have to be bold! I explained politely that I was a coeliac and that I was intolerant to gluten, I might of even used ‘Allergic’ I cant remember , just to get my point across and asked if it was possible for someone else to serve me. They were really understanding and quickly someone else took over with a new clean cup. It caused a little conversation with my fellow customers but that is always a good way of raising awareness. 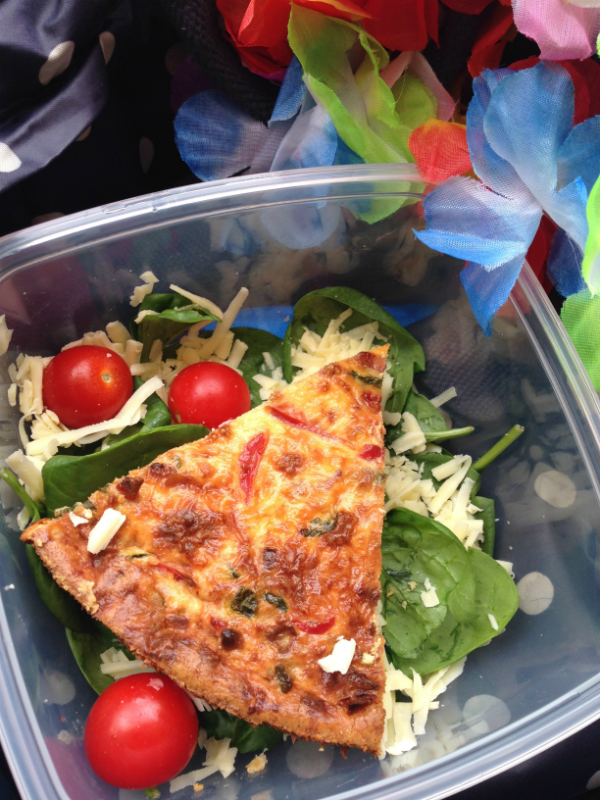 Every day I took in a slice of quiche with a green salad, a cheese scone, individual wrapped cheese cubes, fruit and the homemade fruity bread and a treat nak’d bar or gluten free biscuit. Along with the almond milk for tea and plenty of water I was well away. It is worth mentioning drinks at festivals. Reuseable cups are used and beer and larger is the drink of choice for most. Gluten is obviously an issue here both in the drink and in a poorly washed up cup. There was gin and tonic on offer cider and pimms , I was able to have a couple of cheeky G & T’s . 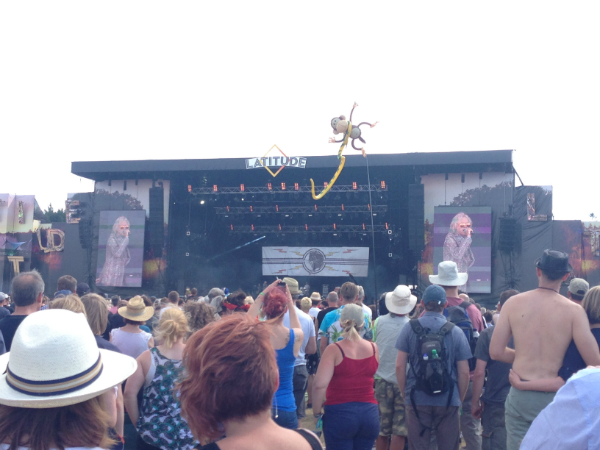 The spirits were served in a smaller reusable festival cup. Water taps are available for refilling your bottles. The variety of music, comedy, theatre etc is incredible and you can never get around everything. 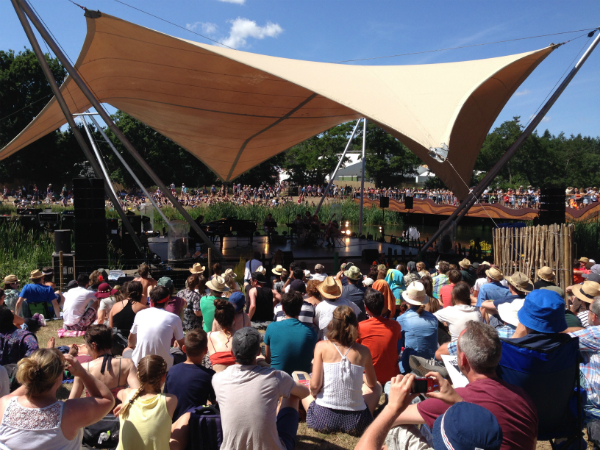 My highlights were Chilli Gonzalez and the kaiser quartet , Badly Drawn Boy, Soak, Songhoy blues, Naomi Shelton and the gospel queens ,Years and Years, Catfish and the bottlemen, José Gonzalez and Lianne La Havas. I Missed out on seeing Leon Bridges as he clashed with other bands and we couldn’t get in to Stornoway’s set but listened outside. 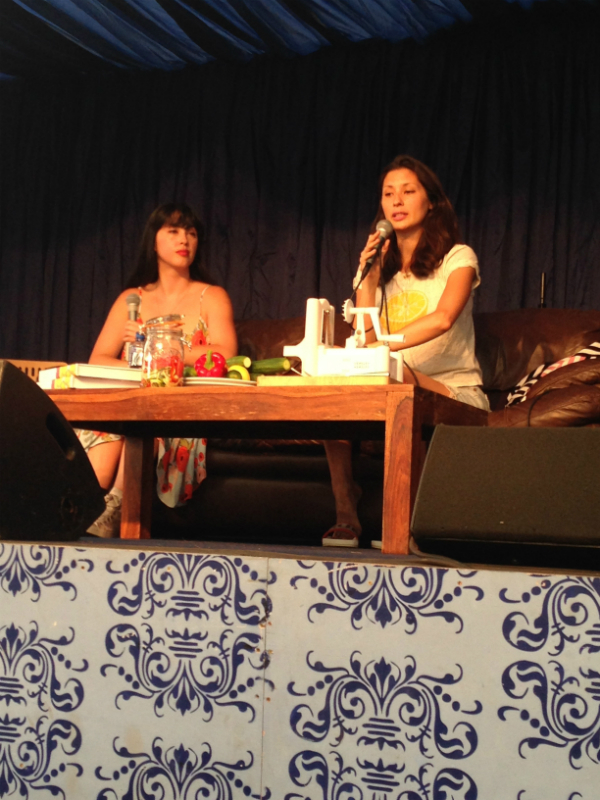 Sunday saw a visit from Hemsley and Hemsley to the Literature tent. I was fortunate to arrive early and picked a great spot up the front. Jasmine and Melissa talked about their food philosophy and their book and I was in total agreement with what they said. Lots of up to date information on good fat, the importance of bone broth and avoiding processed food, food high in sugar and avoiding grains etc. Generally enthusing the audience and inspiring us all to take a good look at what we were eating. Also how we could make favourite meals more healthy. It was good to hear Jasmine and Melissa talk about digestion and chewing and the ladies even talked about learning more about ‘what is a healthy poo’. and getting your digestion on track. 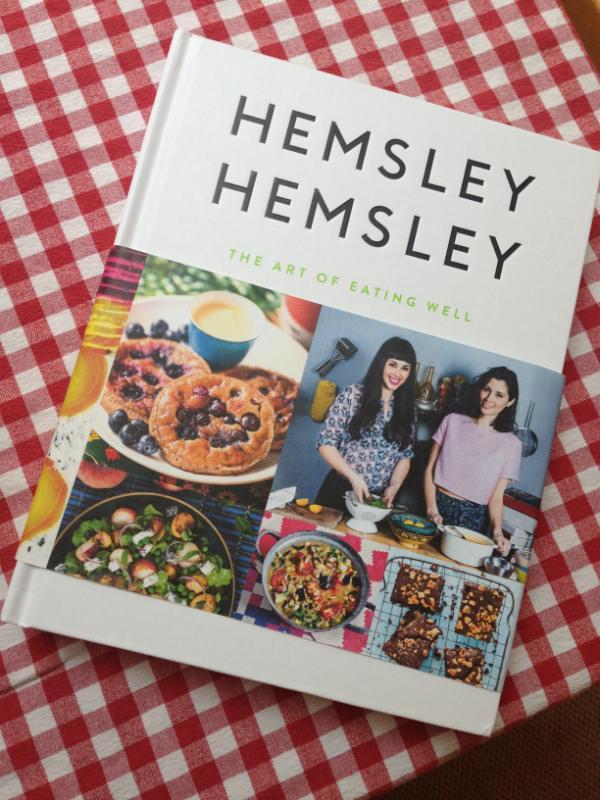 You can catch Jasmine and Melissa Hemsley again this year at The Big Feastival where they will be talking and demonstrating, along with Deliciously Ella and others passionate about healthy eating. Hoping to be at The Big Feastival myself, maybe see you there!